Based on the Law of the Republic of Indonesia No. 40 Year 2007 regarding Limited Company (Law of Limited Company), the corporate structure consists of the General Meeting of Shareholders (GMS), the Board of Commissioners and Directors. GMS conducts important decision-making based on the interests of the company, in accordance with the statements in the Articles of Association and prevailing regulations. 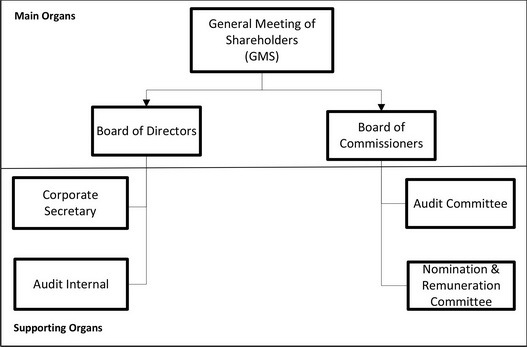 Company Management is carried out by Directors, whereas the Board of Commissioners conducts adequate control of the performance of company management. However, both have responsibilities to maintain the sustainability of Company business over the long term. Therefore, the Boards of Commissioners and Directors have a similar perception concerning the Vision, Mission and Company Values. To assist the implementation of the Board of Commissioners’ supervisory functions, the Company has formed 2 different committees, namely the Audit Committee, Nomination and Remuneration Committee. In addition, the Company has also established the Company’s Corporate Secretary, Investor Relations, and Internal Audit, tasked with assisting the Board of Directors in performing its GCG duties.